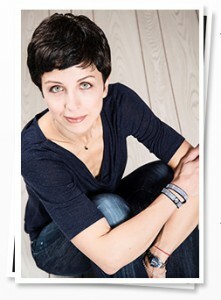 Indigo Star owner and jewelry designer, Susan Scarlett, was born and raised in Vancouver, BC. Her journey as an artist has taken some unexpected twists and turns before bringing her to her current life path. After completing two years of medical school, Susan realized that medicine wasn’t her destiny so she took a leap of faith, only to discover that her true passion was designing and creating sparkly, dazzling jewelry that women would feel empowered and beautiful wearing! Susan made her first mark in the jewelry world in 1999 when she began making handmade crystal hair accessories. She gave them as gifts, and when she received countless compliments and orders for more, she knew she was on to something. It was then that she launched her jewelry design company, and Indigo Star was born. In the beginning, Susan created her simple designs using crystal beads. But her love of silver quickly led her to integrate the precious metal into her handcrafted pieces. She learned how to create and manufacture her own silver jewelry, which quickly advanced her design innovation. Susan developed such a fondness for Swarovski Elements crystals and their sparkling, world class quality; that she found herself incorporating them into all of her designs. So in 2009, when Indigo Star was invited to become a branding partner with SWAROVSKI ELEMENTS – The Crystal Elements Brand of Swarovski, she was overjoyed! This amazing partnership ensures that Indigo Star is on the cutting edge of the latest design trends and privy to the season’s newest collection of crystal shapes and colors. Susan’s line of Indigo Star jewelry is lovingly handcrafted in her North Vancouver studio, and each piece has a story and an energy within. Her creations can be found ‘sparkling’ in select boutiques and galleries around town; simply click here to find a jewellery store in your area or shop online now by choosing a jewellery category above.